Lessons and data from the MVP sites on human livelihood indicators, agricultural management practices, and crop productivity co-located and combined with field based environmental measurements provide a unique opportunity to assess the tradeoffs and synergies of agricultural intensification, human wellbeing, and ecosystem services across a range of agroecological zones and farming systems. 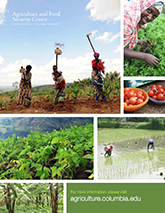 This research examines changes in agricultural production and livelihoods following interventions in the MVP and the associated changes (tradeoffs and synergies) in ecosystem services. The analysis will provide guidance to minimize potential negative impacts on the environment as well as to develop incentives to encourage practices that result in synergistic outcomes, such as increasing carbon sequestration, improving water quality improvements, etc.